and enhanced results if you adhere to some of our simple guidelines. Please take the time to read the guidelines for your particular procedure so you get the best results possible. If you have any questions or concerns, please do not hesitate to call us on 07769692710 / 01376 584555. 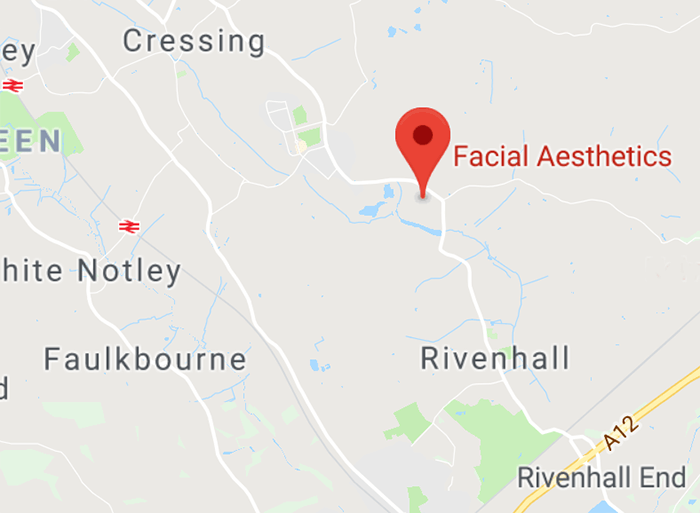 Your initial visit to Facial Aesthetics Essex Skin Clinic begins with a FREE, no obligation consultation. For injectable procedures (Such as Botox Injection treatments), your consultation and treatment will be carried out by our Specialist Cosmetic Nurse. For Peels, HydraFacial and skin care, You Will initially be assessed by Our Specialist Cosmetic Nurse and Clinical Director to devise a Treatment Plan and then your treatment will be carried out by one of our Skin Peel Specialists. Your consultation will begin by listening and understanding your concerns and discussing how to meet and try to exceed your expectations. We will clearly outline the various treatment options available, together with the benefits and any potential risks of each treatment. Any questions you have about the process or treatment will be answered honestly so together we decide on the most appropriate treatment for you. Any necessary pre and post-treatment after-care will also be explained in detail, We will provide a link to our website for this and will also provide a paper format for you. There is no obligation to book a treatment with us after your consultation as the consultation is entirely complimentary. Above all, we Promise Never to force you into having a treatment and we will only ever treat where appropriate. Not suitable for areas with skin disease or infections. Patients with active cold sores or warts, skin with open wounds, sunburn, excessively sensitive skin, dermatitis or inflammatory rosacea in the area to be treated. Please inform me if you have any history of herpes simplex. Patients with a history of allergies (especially allergies to salicylates like aspirin), rashes, or other skin reactions, or those who may be sensitive to any of the components in this treatment. Note: The use of these products/treatments prior to your peel may increase skin sensitivity and cause a stronger reaction. Patients who have had Muscle relaxants injections should wait until the full effect of their treatment has developed before receiving a Peel. Products containing retinol, alpha-Hydroxy acid (AHA) or beta-Hydroxy acid (BHA), or benzoyl peroxide. Any exfoliating products that may be drying or irritating. Patients who have had medical cosmetic facial treatments or procedures (e.g. laser therapy, surgical procedures, cosmetic filler, Microdermabrasion) should wait until skin sensitivity completely resolves before receiving a Peel. If you have a history of herpes infection will need to start an anti-viral medication on day prior to this peel and continue for 7 days. After receiving a chemical peel, the skin may look and feel like a mild windburn with itching, stinging, redness, heat and/or tightness for the next number of days. After 48 hours of a superficial peel, flaking may occur for 3 to 5 days which can easily be controlled with moisturizers. After 72 hours of a medium depth peel, a more extensive exfoliation will occur for 3-7 days. It is recommended that makeup not be applied the day of treatment, as it is ideal to allow the skin to stabilize and rest overnight. To minimize side effects and maximize results, use the post procedure creams provided which is recommended for 3 to 5 days or until flaking has resolved. Moisturizer should be applied at least twice a day but can be applied more frequently for hydration and to decrease the appearance of flaking. Avoid direct sun exposure and excessive heat. An SPF of at least 30 MUST be used daily. Do not go to a tanning bed for at least two weeks post procedure. This practice should be discontinued due to increased risk of skin cancer and signs of aging. Do not have any other chemical peel or medical device treatment until your practitioner at releases you to do so. You may resume the regular use of retinoid, alpha-Hydroxy acid, beta-Hydroxy acid, vitamin c or bleaching creams ONLY after peeling process is complete. You should avoid saunas and extreme heat for 24 hours. A recovery cream may be applied after your treatment to help soothe and calm your skin. You should avoid UV exposure for up to 3 weeks after treatment. Do not shave the treated areas for 24 hours. Immediately after the treatment you will experience some redness, which can last up to two days. You may apply Mineral makeup immediately after treatment to minimize the redness. Skin irritation: May cause mild skin irritation. Pain: There is usually no discomfort after the peel, but, in case there is mild discomfort, pain medications can be provided. You may take an anti-inflammatory Paracetamol if necessary. Redness: A pink or red coloration of the skin may persist for 2-8 weeks after a TCA peel. In rare instances, redness may persist up to six months. This can occur all over or only in certain spots. Wound Healing: Peels cause a superficial wound to the skin that takes approximately 5-7 days to heal. Once the surface is treated, it may be pink and may be sensitive to the sun for approximately 2-8 weeks. Pigment Changes: The treated area may heal with increased or decreased pigmentation. This occurs most often in darker pigmented skin. The darker or lighter areas usually fade in three to six months, though pigment change can be permanent. Swelling: Immediately after the peel, there will be mild to moderate swelling of the skin. This is a temporary condition and will resolve over two to three days. Scarring: There is a very small chance of scarring. This includes hypertrophic scars or, very rarely, keloid scars. Keloid scars are very heavy, raised scar formations. To minimize chances of scarring, it is important that you follow post-operative instructions carefully. It is important that any prior history of unfavourable healing be reported. Eye Exposure: There is also a risk of harmful eye exposure with peels. We will give you protective eyewear. It is important that you keep your eyes closed and have protective eyewear at all times during the treatment. Sun sensitivity: You will be sensitive to the sun for 6-8 weeks after the treatment and will need to protect your skin daily from the sun with sunscreen, hats and sunglasses. Accutane: Generally, you should not have a medium depth peel if you have used Accutane in the last 12 months. Cold Sores: If you are prone to herpes (cold sores, fever blisters), you may need a prescription for acyclovir prior to having medium depth Peel. You will need to avoid exfoliating treatments during a herpes breakout. We will provide a follow-up Post Treatment call to ensure that you are happy with your treatment. Where necessary we will provide a complimentary Review and Top-up where necessary as we always want you to be happy with your treatment outcome. Please remember we will only provide a top-up where clinically indicated and within your treatment plan. Any further questions you have about the process or treatment will be answered honestly. For Some treatments that require regular repeat treatments throughout the year we are happy to provide a follow-up email or text. Above all, we Promise Never to force you into having a treatment and we will only ever treat where appropriate.